Meera Sinha with her guitar. Photo by Elizabeth Mendez. 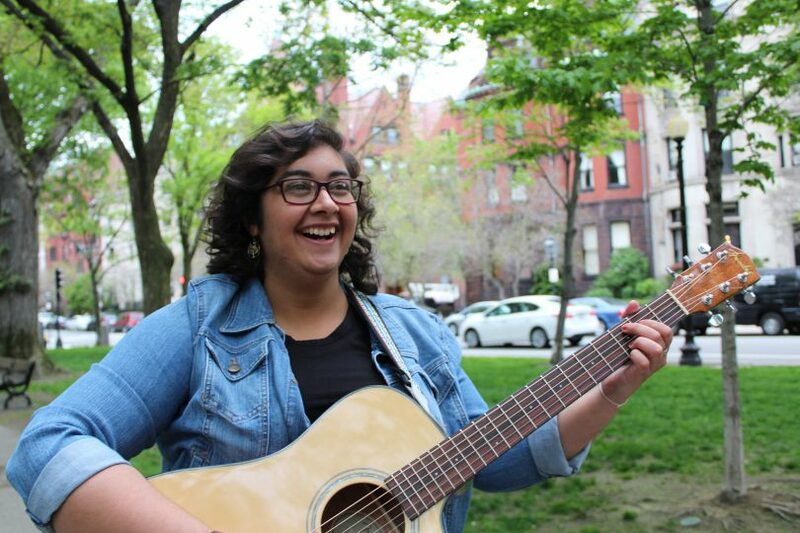 BOSTON – Sitting in a Starbucks in Allston, Meera Sinha peered out from behind black-framed glasses as she recalled the day she realized the power of music therapy. Last semester, Sinha volunteered at the Floating Hospital for Children. Guitar in hand, she knocked on doors and played music for sick children. Her goals were relaxation and socialization. Inside one room was “an itty-bitty baby,” she said. Though she couldn’t reveal many details, she said the the child had trouble sleeping due to distress from illness and loneliness from the long-term hospitalization. Sinha entered quietly. She began lightly picking the strings of her guitar, then added soft humming. She carried on for 40 minutes until finally the child drifted to sleep. “I had never worked with a child that small before,” Sinha said, softening her voice at the memory. “It was a really nice moment to see that music therapy does actually work. Sinha grew up in Hershey, Pennsylvania, which she said “smells like chocolate and cow poop all the time.” Her journey with music began — and almost ended — in piano lessons. She continued to pursue music in school choirs, where she saw so much power in creating music with other people that she decided to make a career out of it. Since then, she has been using the power of music to help all kinds of people – from 1-month-old babies at the Floating Hospital to elderly folk at Sherrill House – through Berklee’s supervised clinical volunteer placement. 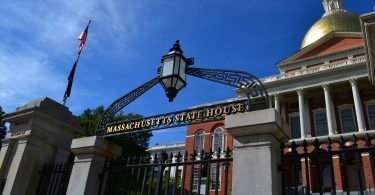 Kathleen Howland, a professor of music therapy at Berklee, said music has a tremendous power in creating joy, comfort and motivation in people who are anxious from physical and mental illness. 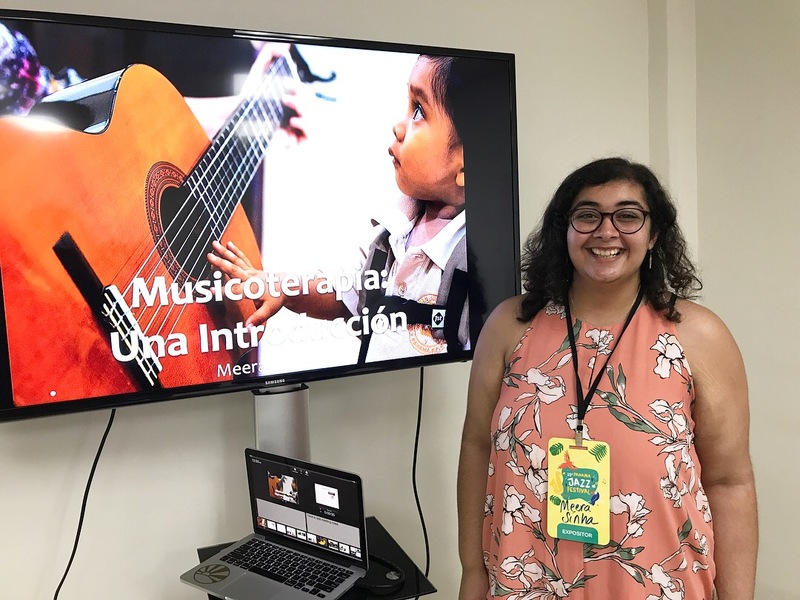 Meera Sinha gives a presentation on music therapy at the Panama Jazz Festival. January 2018. Photo by Emily Campos. While in Hershey last summer, Sinha started a music program at the Mohler Senior Center, where she taught a music and wellness class and a senior choir, leading up to a performance at the end of the program in August. But spending summers back home is not always as fun as a retirement home choir concert. Her mother and father moved to the United States from India almost 30 years ago with her then 5-year-old brother, and Sinha said she sometimes clashes with her parents’ cultural identity. Still, Sinha said growing up with immigrant parents has helped shape her world view and her approach to music therapy, especially when she volunteered at Rosie’s Place, a local women’s shelter. She taught English for non-English speakers through song. She said she was able to connect with some of the women by sharing her parents’ stories. Sinha is also the president of Berklee’s music therapy club and the vice president of The New England Region of the American Music Therapy Association Students. Brittany Burns, Sinha’s best friend since they met in an introductory music therapy class in 2015, said that Sinha is one of the top in their class. She recalled a time Sinha went above and beyond for a class assignment that simulated a potential session with a deaf client. Professor Howland, who has spent time with Sinha during music therapy trips to Panama, said she sees Sinha working as a leader. “We need people that are cultivating leadership qualities,” Howland said of the music therapy field. Though Sinha has finished all of her coursework at Berklee, she is currently doing research work at Teen Empowerment, a local outreach organization in Roxbury for low-income teens, while applying for internships. The time away from the classroom has given Sinha time for her other hobbies: binge-watching “Gilmore Girls” on Netflix, studying the songwriting skills of Sara Bareilles and daydreaming about the organization she wants to create. Sinha’s goal is to found an organization that would help implement music therapy programs around the world that are customized to each region. Sinha, of course, would be the head of the organization.